“Write about what you know,” they say. No one’s above doing that – Hemingway did it; so did Tolstoy and Joyce. Hell, at one time or another, most of the good old boys cannibalised their own lives for their art, and it turns out that Studio Ghibli founder Hayao Miyazaki has done it too. Given his typical subject matter (if there is such a thing) it’s all the more remarkable; Miyazaki’s most successful works cover people morphing into pigs, giant, lazy cat-bus riding monsters, and forest wisps wreaking havoc on mankind. Still, the master somehow manages to insert parts of his own life into the stories. For example, in his Oscar-winning Spirited Away, the bath-house at the centre of the story is approximately based on a very real onsen in Matsuyama, Ehime. Similarly, Mei, one of the central characters in My Neighbour Totoro, is an homage to his niece. 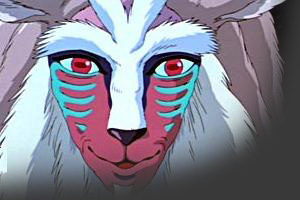 Today we discovered another one – arguably one of the biggest characters ever to appear in a Miyazaki/Ghibli work: the forest in which Princess Mononoke is based. Miyazaki found the real-world version here on Yakushima island, just off the southern tip of Kyushu, and promptly spun a story around it dense green landscape. The entire plot of his 1997 epic is a little difficult to surmise, but essentially it’s a battle of humanity vs nature; greed vs altruism; The Man vs long-haired freaky people. Think Avatar but stealing borrowing less from other films, minus the rubbish effects, plus a lot of soul. That’s Princess Mononoke. The forest is the setting for the whole thing, but very much a character too, filled with creatures and spirits and a number of odd-looking gods. However, most folk – and by that I mean Katy – love the kodama (tree spirits) above all. We went out into the forest this afternoon, without any real hope of finding them, but when we had a look around, we discovered that Yakushima’s foliage really does teem with life. Unlike in other parts of Japan, the monkeys here remain refreshingly skittish – and the deer are timid to the point of disappearing like phantoms. It’s great to see wildlife in their natural surrounds, and in an odd way, it’s nice to seem them still afraid of human contact, too. The animals are just a part of what makes this place special, though, and they don’t really feature much in Miyazaki’s work. No, instead it’s the trees themselves that make this place so venerated. In the summer, Yakushima sits in a bubbling ocean, melting in 40C heat, but in the winter there is frequent and heavy snow. At all times of year there is high humidity. Altogether, that makes for ideal growing conditions – plants cover every bit of undeveloped surface, and other plants ride on the back of them. In the middle of all this, great waterfalls thunder, carrying the excess moisture back out to sea. It’s no surprise Miyazaki saw magic here – so do we. Absolutely stunning! It must be so refreshing to actually see wildlife in it’s natural habitat and undisturbed. Really enjoying your blog so far guys, I’m hoping to re-read it from the beginning once I have a little more time as I’m off to Japan for 6 months in March myself and you’ve highlighted a lot of amazing places I’ll just have to visit on my time off as I’m volunteering in a disabled care home! So kudos to doing what you set out to do and I have to say, you both look like you’ve lost so much weight! I bet that’s crazy, eating beautiful food and losing weight, god it must be like heaven! Hope you are both okay, and are having a good morning! Thanks for your kind comments – and if you’ve got anything you’d like to ask before you head out to Japan, please let us know. And all the best with your own good cause! © 2019 Travel Volunteer Blog All Rights Reserved.